Visual computing interacts with the disciplines of computer science such as image processing, computer graphics, visualization, video processing, and augmented and virtual reality. Over the period, the computer graphics has evolved into a mainstream area in the computer science domain. Currently, with the ever-increasing graphics hardware and software capabilities, this market is growing at a high pace. GPU (Graphics Processing Unit) is the core of modern visual computing technology and propelled the computer graphics to be implemented in various application areas such as gaming, media & entertainment, healthcare, and automotive among others. The report focuses on an in-depth segmentation of this market by different components, display platforms, and applications. The geographic segmentation of the report covers four major regions of the world namely, the Americas, Europe, Asia-Pacific, and Rest of the World (RoW). The regional market has been further broken down by the country. The report also provides a detailed Porter’s five force analysis for the visual computing market. The analysis gives insights into all factors affecting the market and their impact on its growth. The report covers the visual computing market on the basis of components, display platforms, industries, and regions. On the basis of the components, the report has been segmented into hardware and software components. On the basis of the display platforms, the report has been segmented into interactive whiteboard, interactive kiosk, interactive table, interactive video wall, and monitor among others. On the basis of the industries, the report has been categorized into gaming, media & entertainment, healthcare, automotive, manufacturing, and defense & intelligence among others. The geographic analysis covers the Americas, Europe, Asia-Pacific, and Rest of the World (RoW). The cross segmentation data included in the report gives a deep insight about regional markets. The visual computing market is expected to reach $22.02 Billion by 2020, at a CAGR of 22.59% between 2015 and 2020. Visual computing interacts with the disciplines of computer science such as image processing, computer graphics, visualization, video processing, and augmented and virtual reality. Over the period, the computer graphics has evolved into a mainstream area in the computer science domain. Currently, with the ever-increasing graphics hardware and software capabilities, this market is growing at a high pace. 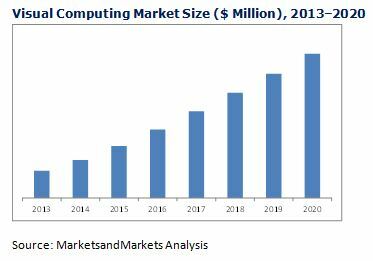 Visual computing market exhibits a huge potential in terms of industries such as gaming, media & entertainment, healthcare, automotive, defense & intelligence, and manufacturing among others. E-learning and scientific research applications are also considered as a major field, where visual computing will be significantly used in the near future. Due to integration of this technology, efficiency can be enhanced to a larger extent. The life-like appearance and real-world experience would create better visualization. The value chain of the visual computing market is from the broad and complex network. The entire chain is an inter-connection between various players related to the complete market, and the flow of technology & services. The prime building blocks of the value chain of the market comprise component manufacturers, software solution providers, technology integrators, and the end-users. In this report, drivers, restraints, opportunities, and challenges for the visual computing market have been covered. The growth of this market is propelled by the industries such as gaming, entertainment, healthcare, and so on. The market is further driven by an enhanced user experience due to an efficient interface and visualization. Factors such as emerging applications and high investments on the R&D are creating opportunities for this market. However, due to usage of high-end GPUs and other processors, the power consumption is too high, but the companies are working out on the same. In the visual computing market, gaming and media & entertainment accounted for a large market share. However, healthcare and automotive industries are expected to grow respectively at the highest rate during the forecast period. Some of the major companies in the market include Nvidia Corp. (U.S.), Intel Corp. (U.S.), Advanced Micro Devices, Inc. (U.S.), ARM Holdings plc. (U.K.), Imagination Technologies Group Plc. (U.K.), and so on. Geographically, this market covers the Americas, Europe, APAC, and Rest of the World (RoW). 12.4 Advanced Micro Devices, Inc.